When Cummings and Kane died, Bernard Lenahan inherited this business, which he renamed B. J. Lenahan Steam Stone Works at 303 Rider Avenue, the Bronx. The 1899 report of Factory Inspectors of the State of New York listed B. J. Lenahan, Cut Stone, with an average of 40 employees, working 54 hours of labor per week. The NY State Dept. of Labor's Industrial Directory of New York State, 1912, listed Lenahan, B. J. & Son, 303 Rider Ave., Lime stone cutting, employing 20 men. On Bernard Lenahan's death in 1915 ownership of the business passed to his son, James Bernard Lenahan (1882-1934), who again renamed it to carry his own name. 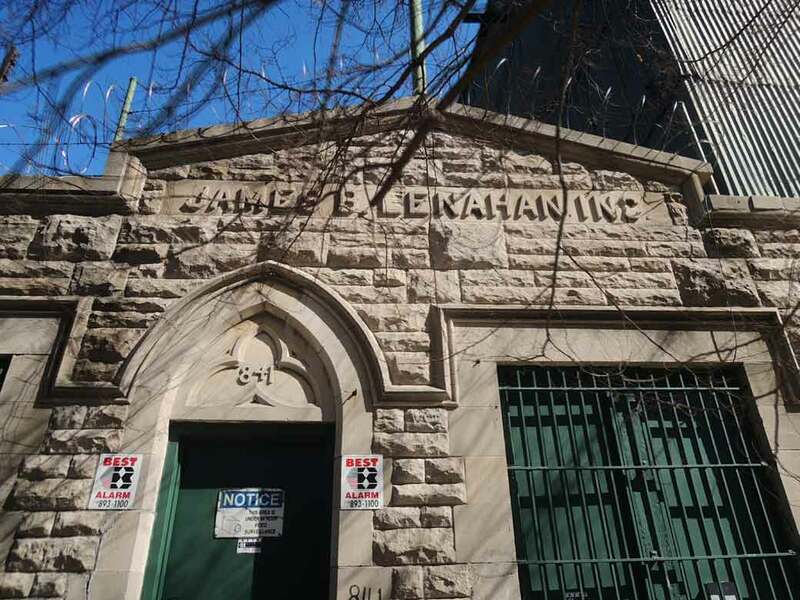 James B. Lenahan Stone Works continued at Rider Avenue and 140th Street from 1915 to 1926. Then, "Cross & Brown Co. sold for the Cleveland Duluth Iron Works a tract of land containing 15,000 square feet at East 135th Street and New York Central Railroad to James B. Lenahan" (New York Times, 29 Aug. 1925, pg. 19). This new property was 841 East 135th Street, and became Lenahan's office until the business closed in 1933. In 1918 James Bernard Lenahan, age 35, born 19 September 1882, cut stone contractor, in business for himself at 303 Rider Ave., Bronx, NY, registered for the World War I draft when he lived at 375 East 209th Street, the Bronx. Lenahan's obituary in the New York Times, 1 April 1934, pg. 28, read, "Mount Vernon, N.Y., March 31. - James B. Lenahan, in the stone contracting business in New York City, died suddenly of heart disease last night at his home in Crestwood. He was a native of Albany and had lived in Bronxville for about seven years before moving to Crestwood. Mr. Lenahan was a member of the General Contractors Association, the Lions Club of New York City, the Schnorr Club of the Bronx and the Dunwoodie Golf Club. His widow, three daughters and a son survive."